If your little New Yorker already thinks they've seen it all, you might consider hustling them down to TADA! Youth Theater's production of B.O.T.C.H. The musical follows seven wayward subway riders into the tunnels beneath New York, where they stumble onto several curiosities even life-long top dwellers couldn't lay claim to. Sometimes the streets of NYC can be the most magical place in the world. This will become true for the next nine days when Bhutanese ritual dancers will be appearing throughout the city every day to perform their mesmerizing ancient Tantric Buddhist demon subjugation dance, called Cham. 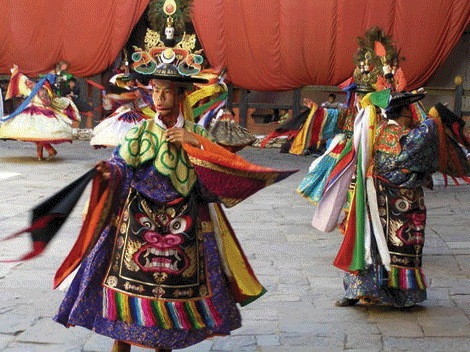 The elaborate costumes of the 13 monks who will be performing are enough to make this event spectacular, but the performance, a kind of danced yoga, makes this a once in a lifetime occurrence. Bhutan is a tiny, secretive and isolated kingdom in the Himalayas, with very little outside influence and extremely limited tourism is allowed, making the opportunity to see the Bhutanese monks dancing on the streets of our city, for free, an absolutely not to be missed opportunity. Whether you want to preserve your heritage, develop your child's brain, or prepare them for the eventual Chinese world dominance, there are many foreign language playgroups in New York City, ready to help you out. Studies show that even brief, regular exposure to a foreign language at a young age can help your child's ability to pick up languages later in life as well as developing their ability to think abstractly and to focus. This is the second in a series of posts listing free demo classes for this Fall. Find more free demo classes and exclusive discounts in our first free demo class post. New Manhattan Movement and Arts Center Children’s Program – Meet the teachers, try out classes, and enjoy additional fun and surprises at an Open House from 9:30 to 5 p.m. on Sunday, September 14, at Manhattan’s newest arts center. The MMAC Children’s Program, launching September 15, offers classes ranging from Mommy & Me to art, music, dance, theater, yoga and martial arts, for ages toddler to teen. Information: (212)787-1178. SPECIAL DISCOUNT FOR Mommy Poppins Readers - $25 off when you enroll at the Open House; use discount code “MOMMY POPPINS". Apple Seeds- Demo reservations are taken on a first come first serve basis, check out their website to see which class fits your little one. To reserve a spot, call 212.792.7590 - note that there is a limit of 2 demos per family, per semester. HOLA! A Playgroup in Spanish is a unique language program where children learn to love Spanish because it's taught in the most original way. HOLA! 's method and philosophy have proven to be most efficient with young age groups because HOLA! follows a natural approach to teaching in order to help develop oral skills. The program focuses on a very wide repertory of concepts to build vocabulary and to acquire the correct use of phonetics on topics of interest in the child' world. Children are given the space to express and create freely while having fun and learning much more than language skills! The classes are taught through the use of original and traditional music, movement, props, games, visuals and art. HOLA!, provides a great introduction to Spanish, and a great way to reinforce Spanish to an already bilingual young child. Summer HOLA! language programs, Ballet and Flamenco en Espa??? ?offered at multiple locations: Appleseeds in the Flatiron District, Aha! Learning in the Upper East Side, Brooklyn Heights at The New York Kids Club and Chelsea. Summer Camp at the Kids Corner in Chelsea!